The city is starting to look very festive as one of the first holiday window displays debuted this week (we’re talking about you, Bloomingdale’s) and we’re already starting to see Christmas lights. Another notable sign that the holidays are getting closer is the opening of New York’s most beloved holiday markets. 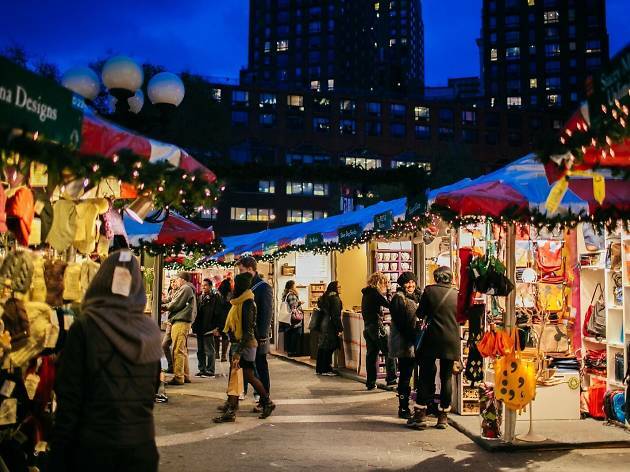 Next up on the list are a few major ones: The Union Square Holiday Market hosted by Urbanspace opens for the season on Thursday, November 15 and the Columbus Circle Holiday Market follows two weeks later—It opens on Wednesday, November 28. There are more than 150 sellers, and some of the shopping highlights include Verrier’s handmade greeting cards, Susan’s Beeswax candles, Min & Mon handbags and more. Make sure to check it out the next time you’re at 14th Street. It never hurts to start your holiday shopping early. Union Square Holiday Market is located at South Plaza and is open Monday through Friday from 11am to 8pm, Saturday from 10am to 8pm and Sunday from 11am to 7pm. The last day to attend the bazaar is Christmas Eve.